And I’m finally getting around to putting up Part II of the Milwaukee mac n’ cheese guest posts from Kelly Peloza! The Mac N Trees is a staple item on the menu at the Riverwest Co-op Cafe and Grocery. The cafe is entirely meat-free and most, if not all, of the vegetarian items can be made vegan. They have really delicious brunch on the weekends with giant pancakes, biscuits and gravy, and a variety of yummy breakfast plates. My favorite co-op sandwiches are the Tempeh Reuben and the Phamous Philly, which is the greatest Philly I’ve had outside of Philadelphia (I’ve actually never eaten a Philly in Philly). Both are fantastic served with a side of Mac N Trees, a sweet and garlicky nooch-based mac that’s mixed up with broccoli florets. You can also buy it out of the deli case by the pound, so keep that in mind for mac n cheese cravings in Milwaukee! Happy Thanksgiving everyone! I’m about to slip into a food coma, so I’m going to keep it brief. 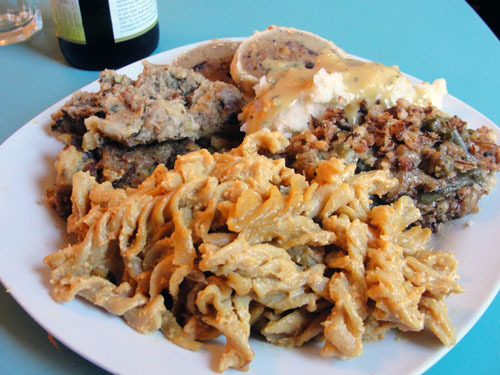 Our meal was Field Roast En Croute, stuffing, green bean casserole, roasted garlic mashed potatoes, golden gravy, and of course mac n’ cheese! 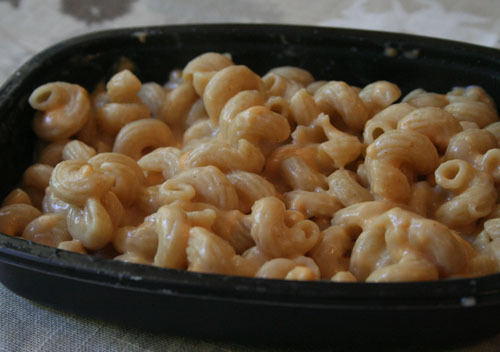 The recipe is the Who Cares Vegan Mac n’ Cheese, one of my all time favorites! It won 2nd place at SF Food Wars Mac Battle Royale with Cheese in 2009. The recipe is super decadent and time consuming, so I only make it for special occasion, but it is well worth the effort! 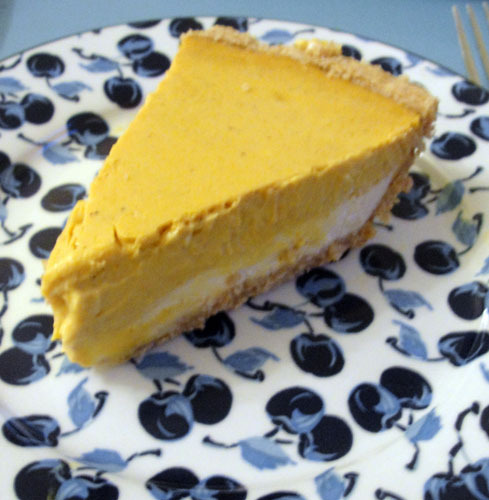 And for dessert we had double layer pumpkin cheesecake! I hope you all had a great Thanksgiving! Now onward to Christmas! Our latest guest post comes all the way from Midwest from the lovely Kelly Peloza, author of delectable baking book The Vegan Cookie Connoisseur and blogger at Seitan Beats Your Meat. 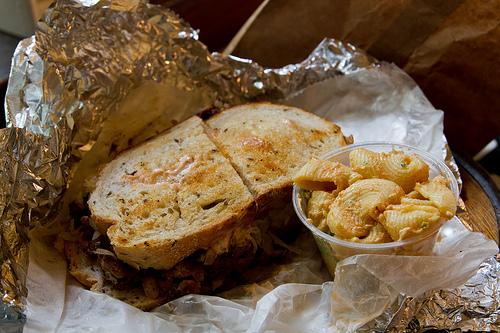 Today she shares with us some really tasty looking offerings from Comet Cafe in Milwaukee. Can someone please take me there now? Comet Cafe has more to offer the vegan crowd than free bacon Sundays and the hamburger-encased grilled cheese sandwich made infamous by Guy Fieri (this was a real thing, I swear! Look up the Diners, Drive-ins, and Dives episode and ignore the bacon propaganda)! Despite all the meatiness, Comet is a go-to restaurant for any vegan in Milwaukee. Their menu has an abundance of vegan diner-style sandwiches, brunch, and entrees such as the Vegan Deep fried ribs, Open-Faced Meatloaf Sandwich, Kelly’s Vegan Breakfast Scramble (I wish I could say that was named after me! ), and some really fantastic french fries. Their Mac n Cheese made vegan is a somewhat recent addition to the menu. It’s your basic nooch sauce mac n cheese with a nutty flavor, baked with breadcrumbs. While the flavor is mellow and not too out of the ordinary, it really shines as straight-up home cooked comfort food. I bet it would be fantastic with a side of chili. Want to share with the world the wonderful noochy and noodl-y offerings in your town? Write a guest post! Last night was a typical Tuesday dinner. 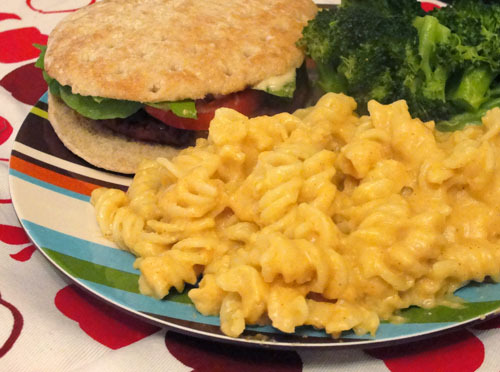 I was exhausted and sluggish from work and had most of what was necessary on hand for a weeknight-style meal of Gardein Beefless Burgers, mac & cheese along with a heaping side of steamed broccoli. I had been planning on choosing the usual recipe in my mac n’ cheese in my repertoire; something from Vegan Table or Appetite for Reduction, but as I turned the pasta water onto boil inspiration struck! 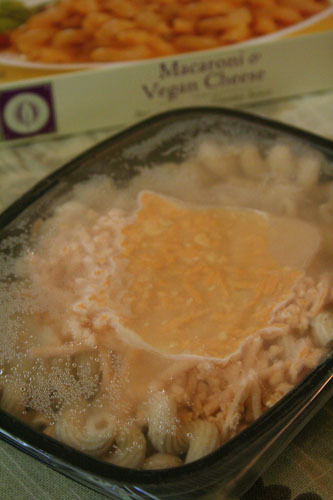 I pulled Julie Hasson’s Vegan Diner off the bookshelf and flipped to the Cheezy Mac recipe. I had tried a few recipes from the book and enjoyed them, so I figured it couldn’t go too terribly wrong. The recipe is straightforward enough. Noodles + cashews + nooch + flour+ cornstarch + spices = mac n’ cheese! I expected the recipe to be good, but about on par with every other vegan mac n’ cheese recipe out there these days. Well, I was wrong because this recipe is straight amazing. A new all time favorite! My mac n’ cheese hating boyfriend even went back for seconds! It actually reminded me quite a bit of a combination of The New Farm Vegetarian Cookbook recipe and the Vegan Table recipe, and since those are two of my favorites magic was bound to happen. The smoked paprika adds a vital and delicious flavoring component without being overwhelming, and that extra tablespoon of nooch added towards the end rounds out this perfectly cheesy dish. One thing that must be commented on is the incredible creaminess! I’ve never tried a mac n’ cheese that was so smooth and thick before. It’s one of those things I didn’t realize was missing from my life until I discovered it. If other recipes just don’t quite cut it for you in the texture department, then you absolutely must try this one! Apparently combining flour and cornstarch is the way to go if you want an over the top decadent dish. As an aside, the buns I used for my burger are from Ozery, a company that makes all sorts of bread-y type products that have been popping up at my local Whole Foods. The buns are thin pita-style sandwich rounds that don’t fall apart when handled. Personally, I like enjoying my burger and all the veggies I load on, not a mouthful of bread, so I think these are fantastic. Careful though, because only one of the 3 types of buns offered are vegan. I had been pretty excited when I heard that Candle Cafe was going to be launching a line of frozen entrees that would be available at every Whole Foods across the country by the end of June. 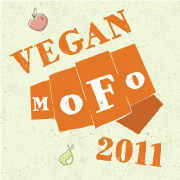 Then I straight up nearly passed out when I heard they would be including vegan mac n’ cheese! I was certain that Candle Cafe had invented some sort of innovative and amazing mac n’ cheese recipe that would change my life forever. I live about 4 blocks from a Whole Foods, so I faithfully scouted out the frozen section for weeks. July 1st came and went and I was very disappointed. I waited a few more weeks before finally catching a glimpse of the mac n’ cheese and ravioli nestled at the bottom of the freezer case. I was sad that they didn’t have the stir fry or seitan picatta. Despite the sticker shock, I purchased both immediately. These little frozen meals are are $7 each! When I got home it occurred to me to have a look at the ingredient list. I was not happy to discover that it was basically pasta, Daiya, water and tomato paste. Really? Really. That’s your ‘A’ game Candle Cafe? I still maintained some hope that it might somehow be delicious, so I threw it in the microwave. As you can see the Daiya is just sort of hanging out on top there. I had to stir and microwave, stir and microwave like crazy to get all the cheese melted and evenly coating the noodles. That’s a lot of work for a frozen convenience meal! I probably could have whipped up an easy nooch sauce in the same amount of time. When it was finally ready I was pleased to discover I liked it much better than the Amy’s frozen mac n’ cheese. I think that the tomato paste and added water help with the texture and flavor quite a bit. It wasn’t too slimy or sticky, and I was able to eat my entire meal without grimacing! Good job Candle Cafe! You’ve cracked the code to mass producing mac n’ cheese with Daiya. While the Candle Cafe mac n’ cheese appears to have far fewer calories than the Amy’s mac n’ cheese (500+) it also seemed to me to be a much smaller portion size. I think it has to do with the density of the pasta. Amy’s uses macaroni so you can squeeze more noodles into the same size carton than you can with fancy-fancy spiral-y pasta. It certainly didn’t fill me up at all, and for seven bucks a pop, I better be able to get real full and have leftovers. While I actually kind of, sort of enjoyed this mac n’ cheese I would be pretty hard pressed to want to buy it again due to the price and portion size. For seven bucks and about the same amount of calories I can get a gigantic Gardein Asada burrito at the Whole Foods burrito bar, so I’ll just go with that. Hello! I do apologize for the lack of noodly updates the past few weeks. Things have been a little crazy around Noochy Noodle headquarters. First I took a trip to my hometown of Austin, Texas (more on that in a moment!) and now I’m working like a crazy person on a super secret project. I wish I could say it was mac n’ cheese related, like I’m moving to Portland to open an all vegan mac n’ cheese food cart, but I’m not! But I think it’s just as cool! Anyway, I am of the humble opinion that Austin is the greatest city earth. There’s something so special about it and I swear you can feel it as you step off the plane. Can you tell I miss it terribly? A lot has changed since I moved to San Francisco from Austin almost 4 years ago. I feel like the number of vegan offerings has tripled since I”ve been away and now I can’t even keep up when I go to visit. Luckily, I did manage to make it to Iggi’s Texatarian, an all vegan food cart. I met up with Chris and Crystal the folks behind the amazing queso from Food For Lovers, plus Chris’ adorable mom,Stephanie from Lazy Smurf’s Guide to Life, and Molly from The Lone Star Plate. We sat around talking and I indulged in some great food! The menu looked so good, I had a really hard time choosing. I wanted to order everything. I finally settled on the side of mac n’ cheese and a chili dog. The mac n’ cheese was just outstanding. It was a potato based sauce, so it had that creamy and startchy texture that I love. Is there Daiya mixed in? I think there is, but it’s really not much at all. The flavor was mild but quite tasty. I could have easily eaten another 3 servings, and I’m still kicking myself for not ordering more. 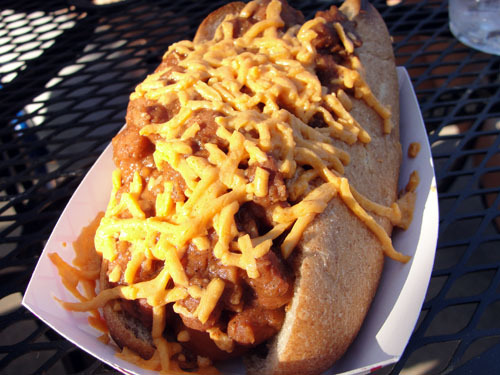 And the chili cheese dog? Well just look at it! 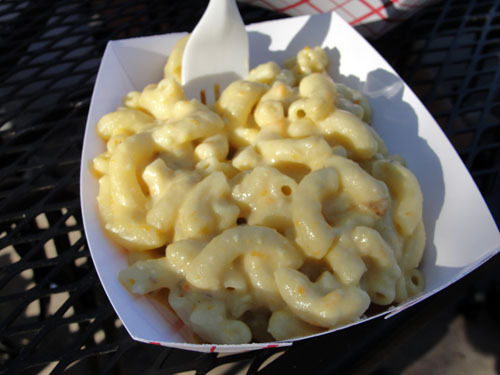 Mac n’ cheese lovers be sure and swing by Iggi’s if you’re ever in the Austin area!